Off Lease Only Palm Beach could not be more thrilled to announce that WE ARE OPEN! We are OPEN come see our new location! After five long years it couldn’t be a better feeling for the Off Lease Only Palm Beach team than to be situated in their new home at 1200 South Congress Avenue! What a happy way to kick-off 2017! And the crowds certainly came out to support opening day. Everywhere you turned, there were customers smiling ear to ear. You could tell that employees and customers alike were thoroughly enjoying the new 10,000 square foot spacious showroom, and the extremely well thought out and organized used car shopping experience. 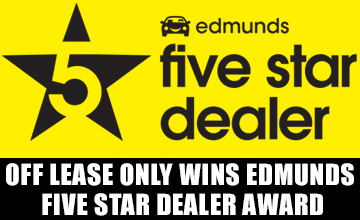 Imagine fifteen acres filled with an impressive selection of quality used cars for sale. Nearly every make and model neatly situated throughout the lot. All open and ready for you to take for a test drive. If you need a used car, it would be hard to not find the perfect one with so many options. The owners were touched by how many repeat customers from Lake Worth and Lantana came out to purchase a vehicle on opening day. A total of 49 loyal Off Lease Only customers bought cars yesterday. Selling 49 cars on a Monday, and the first day open, is certainly a glimpse into the exciting future of Off Lease Only Palm Beach! It is a true testament to how loyal the Off Lease Only Palm Beach clientele has been to this dealership over the past two decades. It certainly was a heartfelt day. Owners Eileen & Mark Fischer are thrilled to open 1200 South Congress in West Palm Beach! Team work definitely makes the dream work at Off Lease Only! 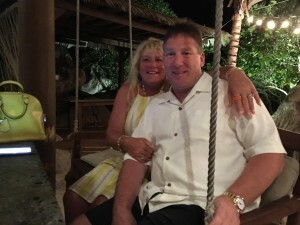 From very humble beginnings, owners Mark & Eileen Fischer bought two cars with their wedding money and have stayed true to their vision of providing a unique and transparent used car buying experience with no hidden fees and no stress of negotiating price. Saving customers thousands of dollars on their used car purchase and caring about every customer’s happiness before, during and after the sale is what has made them grow into The Nation’s Used Car Destination! 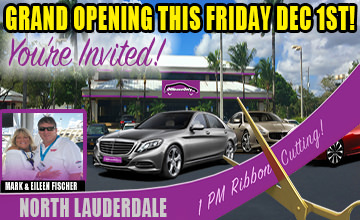 Join us for our Grand Opening Friday, January 6th 2017 at 1200 South Congress Ave, West Palm Beach, Fl 33406! Make sure to stop by this Friday, January 6th for the official grand opening and ribbon cutting ceremony with The Village of Palm Springs! The party starts at 10am with a live radio broadcast and will continue throughout the day. 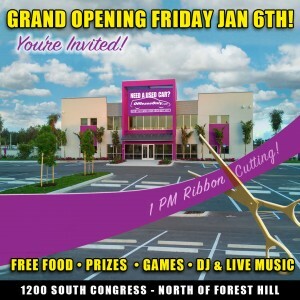 Delicious free food will be served starting at noon, and the ribbon cutting begins at 1pm. We will also have games, tons of prizes including fabulous ones like a $1000 Diamond Exchange gift certificate, DJ, Live Music & more! 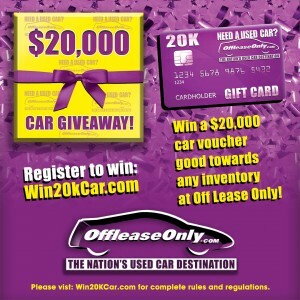 Plus, make sure to register to win the OffLeaseOnly $20k Car Voucher Giveaway contest that launched yesterday! The $20k voucher is good towards any vehicle(s) in Off Lease Only’s entire inventory and the winner will be chosen on January 31st, 2017 at 5pm. You could be the lucky winner of an OffLeaseOnly $20k Car Voucher! Register Today! Simply log on to www.Win20kCar.com and fill out your name, email address and phone number so we can contact you if you are the lucky winner! Complete rules and regulations are available on www.Win20kCar.com. Need a used car? 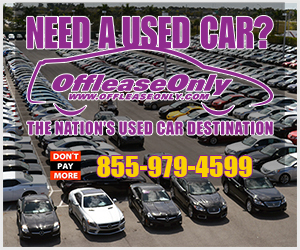 Get driving directions to any of our 4 locations by simply logging on to OffLeaseOnlyLocations.com. 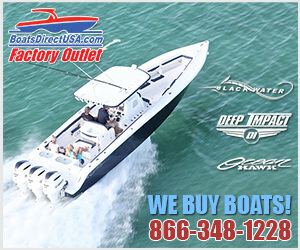 Click the banner below to find the Off Lease Only location nearest you and HAPPY NEW YEAR! 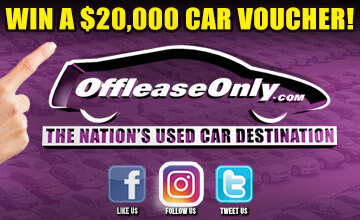 ← Previous Story OffLeaseOnly $20k Car Voucher Giveaway Happening NOW! Next Story → You Are Invited to The OffLeaseOnly Grand Opening This Friday! Follow Us For Your Chance to Win a $20,000 OffLeaseOnly Car Voucher!